Asking questions is one of the most important techniques in communication. Relevant questions can clear up areas that are unclear as well as show interest in what the speaker is saying. In presentations, questions enable the speaker to clarify key points, making sure that everyone has understood. But how do you ask relevant questions? Good questions are related to the ability to listen carefully, and then to choose the best type of question in order to elicit the desired response. We are going to look at five different techniques for asking questions: open, closed, leading, follow-up, and counter. 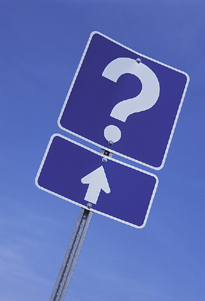 Closed questions lead to yes or no answers and should be used for decisions or for finalizing situations. Use questions such as, “Are you bringing the manuals from the storeroom?” or “Can you sign the contract today?” A closed question does not open up the possibility for the other person to launch into long explanations and it limits possible answers to a bare minimum. Closed questions can be used after a series of open questions or leading questions as a technique for finishing off the discussion. Sometimes we will ask a question that goes unanswered (either intentionally or not). When this happens, it is necessary to ask a follow-up question. Three minutes later the journalist has still not received an answer to his question about the employment figures. Politicians have an ingenious way of sidestepping when it comes to questions that they cannot answer. A good rule is to follow up the minute you realize that your original question is not being answered. In order to follow up quickly you must be good at listening. The best thing is for you to assume full responsibility for the communication. It is possible that your question was unclear. You should give the other person a chance in case you are the one at fault. Another way of evading a question is to ask counter questions. These can be used when you are asked a question which you do not want to answer or when you would like to find out what your counterpart is thinking. When someone asks you a counter question you should note that there may be something that the other person does not want to talk about or something they would rather not reveal. Another reason for asking a counter question is that the person is unsure of your attitude on the subject or lacks confidence in that particular area. A guaranteed way of messing things up is to display uncertainty. If you do not know what you are asking, you can’t expect anyone else to. Show that you are sure about what you are talking about. Make your body language and verbal behavior convey that you expect an answer to your question. When asking questions, your body language should be appropriate. Display positive attitudes, nod a little, lean over towards the other person, maintain eye contact, and make a point of smiling. An important rule is to use ‘how’ questions rather than ‘why’ questions. ‘How’ questions give you reasons, causes, and explanations rather than excuses. Proper use of the art of the question can allow you to unlock the doors of the unknown. No matter how smart you are you will never have all the answers. The trick is knowing exactly what you don’t know, and knowing what questions to ask to get the information you need. Any questions?